CHICO, Calif. — After barely getting out of Paradise alive before the Camp Fire turned her town to ash, Patty Saunders, 89, now spends her days and nights in a reclining chair inside the shelter at East Ave Church 16 miles away. It hurts too much to move. She needs a hip replacement and her legs are swollen. Next to her is a portable commode, and when it’s time to go, nurses and volunteers help her up and hold curtains around her to give her some measure of privacy. “Never in my life did I think I would end up in a situation like this, but when it’s time to go, you got to go,” Saunders said. Under the circumstances, she is in good spirits, with a rotating cast of people stopping by to chat and take care of her. Most of the fire victims here are older folks like her. 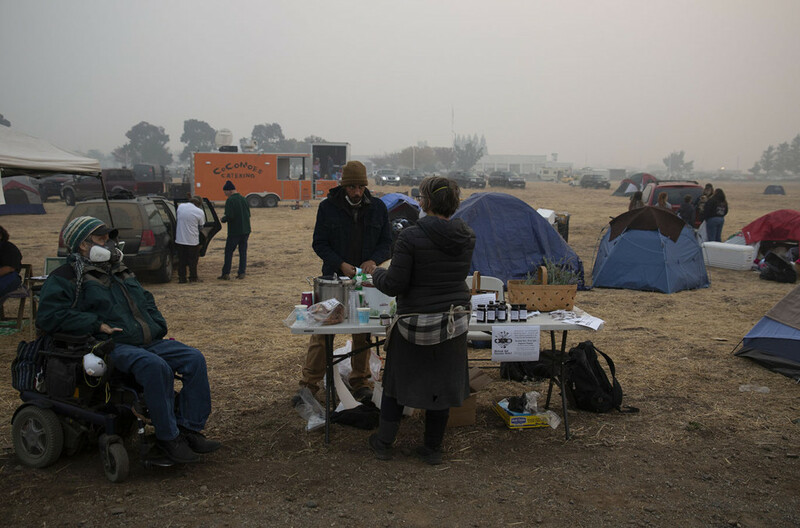 They rest on cots, inflatable beds and recliners in a pop-up community of nearly 200 evacuees displaced by the Camp Fire and an army of volunteers. The Camp Fire, the deadliest in state history, took ruthless aim at older people. Paradise, the Northern California town erased by fire, was largely a retirement community, with a quarter of the population 65 and older. The fire’s death toll was 77 at last count, and nearly 1,000 people were still unaccounted for — most of them seniors. The sheriff’s list of the missing includes many in their 70s and 80s. Like everyone else in the wildfire’s path, older people fled swiftly, if they escaped at all, often leaving behind medications, wheelchairs, walkers and essential medical equipment. Altogether, around 50,000 people are thought to have evacuated, now staying in motels, cars, shelters and a makeshift camp at Walmart in Chico. But the elderly refugees often need more support, especially with chronic conditions and infections that incubate and spread in close quarters. Some need dialysis but can’t get it. Others have respiratory illnesses aggravated by smoke. One woman in a Yuba City shelter was recovering from cancer surgery with a stapled wound. They were felled by norovirus — a nasty stomach illness that causes diarrhea and vomiting. People were throwing up all day. Then, in the middle of night, paramedics came and removed the sickest, according to some evacuees. Last week, nearly all the shelters from Chico to Yuba City were hit by an outbreak of the stomach illness — sending dozens to hospitals. Last week, the Butte County Public Health Department said 145 people in the shelters had been sick with the virus. Fearful volunteers and evacuees rarely shake hands anymore; fist bumps and elbow knocks are highly encouraged. “Just threw up a few times,” said Martha Pichotta, 65, who was staying at the Red Cross shelter in Yuba City, about 50 miles south of Chico. After 24 hours of isolation behind blue curtains, she was released to mingle with other evacuees. Adding to the physical and emotional stress, especially for seniors, was the hurried escape from longtime homes and the disruption of often predictable lives. There was little time for practical consideration, let alone sentiment — beloved pets and rooms full of memories were lost. Beeson, whose shelter mates were taken to the hospital, said her adult son put his hand on her back to steady her, yelling, “Run, mama, run!” The only reason they escaped the fire alive was because a car picked them up and whisked them to freedom. David Jackman, a 72-year-old man, said he shuffled down the road as fast as he could, leaving behind his dog and his walker as the flames overcame his house and propane tanks exploded behind him. A firetruck came to his rescue — likely saving his life. Saunders, the 89-year-old Paradise resident, nearly burned to death in a car. One side of it melted. Most of the older folks in the shelter said they couldn’t be more grateful for all the support and care they’ve received. Even so, life in a shelter is hard. Denise Parker, a Red Cross volunteer in Yuba City, said they can offer displaced people Pepto-Bismol and lots of Gatorade. But some were so dehydrated they needed to be hospitalized. Parker said they double-bag all waste and isolate those who are sick. Parker recently got a request for an oversize wheelchair but wasn’t sure how to find one, she said. One evacuee needed dialysis, but they didn’t have the resources to drive the hundred or so miles back and forth to get him to a clinic. 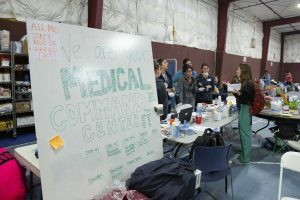 A nurse and doctors stop by to write prescriptions, Parker said, but for more complicated conditions the shelter struggles to meet the need. They aren’t a full-fledged medical facility. 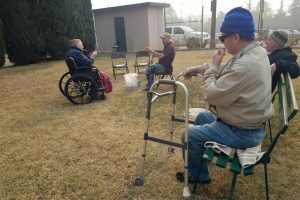 Ron Cooper, a 78-year-old who evacuated his home in Magalia, 5 miles north of Paradise, was staying at the Yuba City shelter with his wife, Jacque. Days after the fire hit, Jacque was released from the Oroville Hospital, following surgery to remove a cancerous kidney, but couldn’t go home. Her husband said she is doing OK in the shelter, even with a stapled wound in her side, but was concerned that she won’t eat or drink. 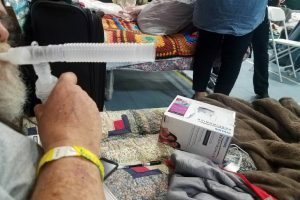 David Ramey, a 64-year-old with a scraggly beard, lounged on an inflatable bed at the Chico shelter, puffing on a nebulizer to soothe his emphysema. It was acting up because of the soupy smoke hanging in the air. He bought the device soon after getting out of the danger zone. Many of those who lost nearly everything are in a limbo state, not knowing what they will do next. Some are waiting on assistance from the Federal Emergency Management Agency or for an insurance check. Others are looking for affordable housing in nearby communities. Paradise was attractive not just because of its natural beauty but because housing was reasonably priced for retirees. Several evacuees, like Pichotta, had been living in mobile homes. 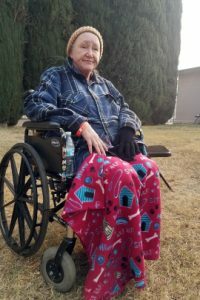 At the Yuba City shelter Saturday, Pichotta sat in a wheelchair puffing on a cigarette with a blanket over her legs. She was talking with her 33-year-old son about what they should do now. The short answer: no idea. “My mobile home is this high,” she said, placing her hand a few inches above the ground. They didn’t have residential insurance and their only monthly income is a $900 Supplemental Security Income check. While she doesn’t know where she will end up, she knows her life in Paradise is over. ← Orange Juice, Leafy Greens, Berries Tied To Decreased Memory Loss In Men?